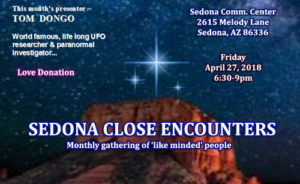 Come join us for his new monthly gathering that is intended to bring together ‘like minded’ people in the greater Sedona area, and beyond, who wish to learn more about the likely reality of extraterrestrial, and/or higher dimensional, life visiting planet Earth. And, how contact with these off planet beings affects all of us… and changes, or has already changed, our lives. Each monthly Speaker will share his or her own personal experiences, knowledge, and/or extra sensory gifts, with attendees during their presentation. For each meeting in the coming months there will also be an intelligent, interactive, post-presentation discussion session for everyone as part of each evening’s activities.